We are all exposed to toxins. Toxins exist in the air we breathe, the land we walk on and the food we eat. We do a detox cleanse to access the best superfoods from nature. Like gasoline or fuel for motor vehicles, we want the best premium stuff. Generally speaking, we detox through our sweat, urine and/or our bowel movements. What we can’t expel stays in our bodies and can sometimes create cardiovascular or autoimmune health issues in humans. Hope this makes sense. Are you with me? Unfortunately, the list goes on but shop for the DETOXELICIOUS book to get more statistical details. I don’t want this to be an exhaustive conversation about statistics but rather offer encouragement that our bodies are miraculous when we make lifestyle changes. I even have a funny list of reasons why you should get this book. A 10-day break out of 365 days a year is not much to ask for our organs’ sake. Let’s unpack this internally and externally. Given the complexity of foods, it truly makes sense to give our kidneys and liver a well-deserved hiatus. I don’t think it’s a lot to ask of ourselves to take a detox cleanse or swap out our beauty products for cleaner skin care products. Time and time again, most functional doctors believe plant-based foods and safer skin care products will help our bodies detoxify. Our skin is our largest organ. The goal is to give our organs a much-needed break: from preservatives like parabens or BHT for better skin care; and from sugars, dairy, grains and complex proteins like animal meat for healthier plant-based food choices. You’ve got this. I truly made plant-based foods look really delicious and displayed yoga fitness poses effortlessly in this book. 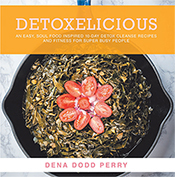 Get the Detoxelicious book. No excuses. Your body will love the results. Get more energy! 100% return guaranteed.